Founded in 2006, Darlington School’s Glenn Teaching and Learning Center provides individualized academic support to students pre-K to 12 with identified learning differences. Our learning specialists work directly with students in the students in the Center and in the classroom to help them achieve academic success. In addition, with a rich history of over 100 years, Darlington is the only school in Northwest Georgia to offer a program specifically designed to support students with dyslexia. Focusing on grades 2-5, the Accelerated Learning Program for Dyslexia provides necessary remediation with learning specialists, while allowing students enrolled in the program to have a traditional school experience. For more information, contact admission@darlingtonschool.org. 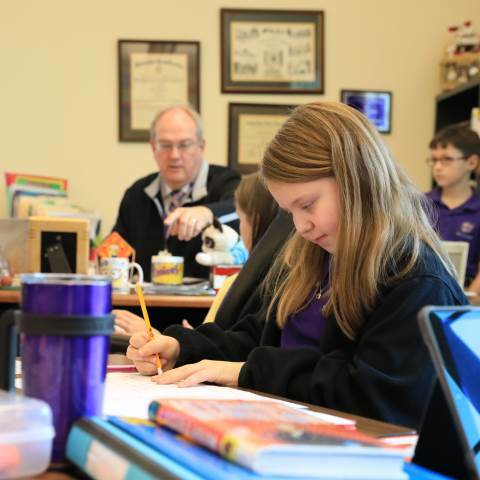 At the Upper School, each student who receives direct support from the Glenn Teaching and Learning Center is assigned to a learning specialist, who serves as his or her academic coach. Students are scheduled to spend one period in the Center to meet with their coach. Learning specialists assist students in developing goals, identifying action steps and planning for accountability, while also helping them become better self-advocates. Coaching sessions keep students on track and allow them to quickly address obstacles that interfere with progress. Learning specialists work closely with teachers, heads of house, deans, administrators and counselors to customize the support and accommodations for each student in their care. They also oversee classroom accommodations and collaborate with teachers to empower the students to learn effectively. Additionally, the director of the Glenn Teaching and Learning Center meets with students and parents to submit an application for accommodations on the SAT and AP Exams. Students and parents can also get help applying for accommodations on the ACT. The Pre-K to 8 Teaching and Learning Center addresses emerging learning issues for children in pre-K through eighth grade. Darlington recognizes that successful students are a product of many influential people. Teachers, parents, advisers, coaches, and support personnel are the vital members of our community who contribute to a child’s positive school experience. The role of Darlington’s learning specialists is to provide support to the entire community through instruction, professional development, parent resources. In assessing the best ways to support a student academically, learning specialists work with the grade-level team to provide a variety of interventions and strategies for that student through the Student Action Plan. For those students who have psychological testing the Teaching and Learning Center will implement many of the strategies suggested as a result of the evaluation. For example, students may qualify to receive extended time for tests or be allowed to take them in a small group setting. The team evaluates the effectiveness of all strategies once they are implemented, and non-effective strategies will be documented and discontinued. During the TLC Power Hour, students have the opportunity to work with a learning specialist to build their academic skills. Before-school and after-school study hall provides additional academic support. Any student who wishes to work with peers or who wants to complete homework in a structured, academically-friendly environment is welcome. Power Hour operates daily from 7:30 to 7:45 a.m. and 3:15 to 4 p.m.
A detailed explanation of all Pre-K to 8 Teaching and Learning protocols and services can be found in the Pre-K to 8 Parent and Student Handbook.